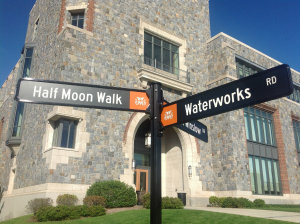 New street names on the Marist campus stand as cautionary symbols for administrators who like to get recklessly, mind-numbingly blazed at work. After a night spent torching bowls and stealing Bob Marley posters from freshman dorm rooms, administrators were reportedly surprised to see these signs appearing all around campus. A quick investigation reminded administrators why they generally don’t call the shots after taking a series of massive bong rips to the face. One administrator allegedly suggested naming the main road Marist Drive, but this idea was quickly shot down in favor of a more universally relatable name: Edvard Bech. “The Danish businessman who fostered the Poughkeepsie iron industry in the 1850’s just felt like the most relevant historical figure to represent our school at the time,” said Marist President Dennis Murray, quickly hiding a bottle of eye-drops. Among the other notable signs, Waterworks Drive has perhaps acted as the most powerful reminder to administrators of why they avoid making campus plans while watching Dazed and Confused in a thick haze of pot smoke. A concrete explanation for Waterworks Drive has not been found, but the consensus is that it is named after a gay bar–perhaps a latent memory sparked by the enlightening influence of mind-altering drugs that, in retrospect, really shouldn’t be used before deciding to make permanent changes to a college campus. Administrators’ next plans for Marist include installing a hookah bar in the student center and getting Phish to play the SPC spring concert. November 5, 2014 in On-Campus.